This xStarter feature allows you to synchronize folders on a local computer or between two PCs across a network. It is just one of the many time saving features packed into this powerful task scheduler. It can be triggered by the advanced scheduler on a wide range of system events. For example, it can be launched after file or folder creation, modification or deletion. xStarter can execute a wide range of other xStarter automated tasks before or after synchronization. For example, you may need to archive data, send email notifications, run another process, execute a windows macro, before or after synchronizing. * After synchronizing there are available list of new, changed and deleted files and folders. ** Possible with using of third-party software that transforms Internet folders into local drives on you PC. 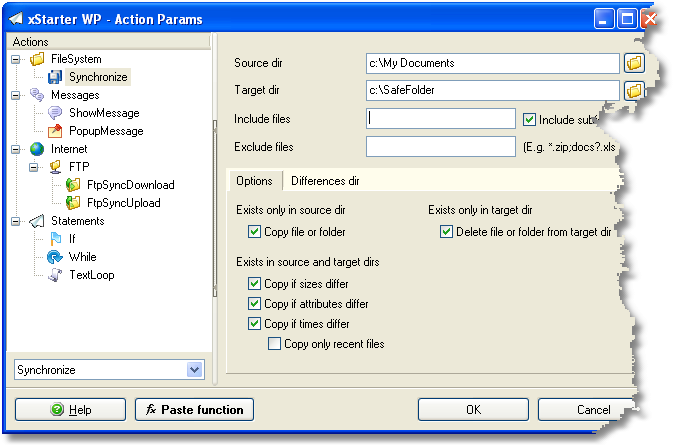 There are also available actions in the xStarter to synchronize FTP folders. Here are the xStarter operations related to folder synchronization. This is a full path to the folder that the Target Dir is synchronized with. This is a full path to the folder which is synchronized with Source Dir. This setting determines whether xStarter should copy a file if it exists only in the Source Dir (i.e. in the location that the files are to be synchronized with). Folders "c:\MyWorkFiles\" and "c:\MyHomeFiles" are being synchronized. The first folder contains "doc1.txt" file, but the second folder does not. This setting determines whether the file will be copied to the "c:\MyHomeFiles" folder. This setting determines whether xStarter should delete a file that exists only in the destination folder. Folders "c:\MyWorkFiles\" and "c:\MyHomeFiles" are being synchronized. The second folder contains the "doc1.txt" file, but the first folder does not. This setting will determine whether the file will be deleted from "c:\MyHomeFiles" folder. This setting defines whether xStarter should copy a file if it exists in both folders. The file will be copied if sizes of source and target files differ. The file will be copied if attributes of source and target files differ. The file will be copied if "last modification time" records of source and target files differ. It allows to not copying files in the target folder if files are newer on the source folder. For example It can be used, for synchronizing desktop and laptop computers and not overwriting newer files on another side. There are possibility to copy only new or changed files in third folder called as “Differences dir”. It can be useful for sending to your customers only changed or new files from last sending.